Tharpu Chuli peak climbing also known as Tent Peak, is one another most popular peak climbing situated in Annapurna region. It is one of the most demanded peaks in Nepal as this peak climbing is often combined with the trekking in Annapurna circuit trekking. This trip has been much demanded among the clients of Holiday Adventure Nepal, because, it is combined with other trekking trails among the trekking peaks in Nepal. It has been popular trail as it provides an unsurpassed panoramic views and eye-catching Himalayan scenery. Chulu peak climbing trekking has been wildly recognized as a paradise for nature lovers as it offers an spectacular views of a number of Himalayas including Annapurna, Dhaulagiri, Manaslu, Fishtail and landscape, wild animals, monasteries as well as mixed cultural trekking tour. 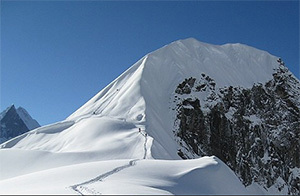 This trekking provides the panoramic sceneries of Himalayas, including of the Mt. Dhaulagiri (8167m), Mt. Annapurna I (8091m) Mt. Manaslu (8163 m), Mt. Annapurna II (7937 m.) , Mt. Annapurna III (7555m), Mt. Annapurna IV (7525m), Mt. Annapurna south (7219m), Mt. Nilgiri (7041m), Mt. Fishtail also called Mt. Machhapuchhare (6998m), Mt. Hiunchuli (6441m), Mt. Lamjung Himal (6986m),Tukuche peak (6920m), Tilicho peak (7134m). Day 01: Arrive and Transfer to Hotel. Stay overnight at Hotel. Day 02: Full Day sightseeing around Kathmandu. Visit Durbar Square, Swoyambhunath, Boudhanath & Patan city. Stay overnight at Hotel. Day 03: Fly from Kathmandu to Pokhara 30 minutes. Stay Overnight at Hotel. Day 11: Rest of day for the acclimatization in ABC. Day 13: Rest of day for acclimatization in Base Camp or High Camp. Day 18: Trek from Jinu Danda to Nayapull and then Drive back to Pokhara - overnight at Hotel. Day 19: Singhtseeing in Pokhara valley and rest of day. Day 18: Fly from Lukla to Kathmandu and Overnight at Hotel. Day 19: Transfer to Airport & Flight Back to Kathmandu, Transfer to Hotel and Stay overnight at Hotel. Day 20: Departure to Airport and Fly Back to Home.